Is it Polish? No – it’s a Czech Scam! I would say that 99% of all the scams I see are in English. A smattering of French, Russian and German, even occasionally Italian and Spanish. I have no way of identifying character-based languages (Japanese, Chinese) but I try. This is a new one for me – I first assumed it was Polish, but Google Translate tells me that it is in fact Czech! Nothing in the email explains why this is so and the bank references is a British bank and the email address is also British. ProsÃ­m, mÅ¯Å¾ete vÄ›Å™it? Jsem pan Ewen Stevenson, pracuji tady v Royal Bank of Scotland – Anglie. DÅ¯vÄ›ryhodnÃ½ poradce pro vÃ­ce neÅ¾ 20 let a v souÄasnÃ© dobÄ› mÃ­stopÅ™edseda vÃ½boru pro audit Group / finanÄnÃ­ Å™editel; Royal Bank of Scotland – Anglie. Rozhodl jsem se hledat dÅ¯vÄ›rnÃ© spoluprÃ¡ce s vÃ¡mi pÅ™i provÃ¡dÄ›nÃ­ dohodu tady pod popsÃ¡no, Å¾e bude mÃ­t ohromnÃ½ pÅ™Ã­nos pro nÃ¡s oba i tÄ›ch mÃ©nÄ› privilegovanÃ½ch bude mÃ­t rovnÄ›Å¾ prospÄ›ch, a doufÃ¡m, Å¾e si udrÅ¾Ã­ to jako vrchol tajnÃ© vzhledem k povaze transakce. V prÅ¯bÄ›hu naÅ¡eho Bank roÄnÃ­ho auditu, jsem zjistil, nevyÅ¾Ã¡danÃ½ / opuÅ¡tÄ›nÃ© fondÅ¯, celkovÃ½ souÄet Â£ 21.500,000.00 britskÃ½ch librÃ¡ch (dvacet jeden milion pÄ›t set tisÃ­c britskÃ¡ libra) v ÃºÄtu, kterÃ½ patÅ™Ã­ k jednomu z naÅ¡ich zahraniÄnÃ­ch zÃ¡kaznÃ­kÅ¯ (Late pan . Moises Saba Masri), kterÃ½ byl Å¾idovskÃ½ (syrskÃ©ho extrakt) mexickÃ½ podnikatel bohuÅ¾el dne 10. ledna 2010, Saba pÅ™iÅ¡el o Å¾ivot potÃ©, co jeho vrtulnÃ­k havaroval v Cuajimalpa spolu s manÅ¾elkou, synem a manÅ¾elkou svÃ©ho syna. Volba VÃ¡s kontaktovat vzbudil z geografickÃ© povahy, kde Å¾ijete, obzvlÃ¡Å¡tÄ› vzhledem k citlivosti na transakce a dÅ¯vÄ›rnost zde. NynÃ­ nÃ¡Å¡ bankovnÃ­ bylo ÄekÃ¡nÃ­ na nÄ›kterÃ½ z pÅ™Ã­buznÃ½ch pÅ™ijde-aÅ¾ k tvrzenÃ­ o dÄ›dickÃ© fondu, ale bohuÅ¾el vÅ¡echny snahy se, Å¾e neplatnÃ©. OsobnÄ› jsem byl neÃºspÄ›Å¡nÃ½ pÅ™i rozmisÅ¥ovÃ¡nÃ­ ani pÅ™Ã­buznÃ© ani Å¾Ã¡dnÃ½ nejbliÅ¾Å¡Ã­ pÅ™Ã­buznÃ½ k (pan Saba) po dobu 5 let. Na tÃ©to tÃ½Äe, teÄ mÃ¡m usilovat o vÃ¡Å¡ souhlas k vÃ¡m jako dalÅ¡Ã­ pÅ™Ã­buznÃ½ / Bude pÅ™Ã­jemce, aby zemÅ™elÃ©ho tak, Å¾e vÃ½tÄ›Å¾ek z tohoto ÃºÄtu ocenÄ›n na 21,5 liber milion britskÃ½ch librÃ¡ch Å¡terlinkÅ¯ mÅ¯Å¾e bÃ½t vyplacena na vÃ¡s. To bude vyplacena, nebo sdÃ­lenÃ¡ v tÄ›chto procent, 50% pro mÄ› a 50% na vÃ¡s. Slibuji, Å¾e poskytnou vÃ¡m vÅ¡echny nezbytnÃ© a prÃ¡vnÃ­ informace je, Å¾e mohou bÃ½t pouÅ¾ity k zÃ¡lohovÃ¡nÃ­ toto tvrzenÃ­ jsme o tom s bankou. VÅ¡echno, co potÅ™ebujete, je nahrÃ¡t svÃ© osobnÃ­ Ãºdaje, jak je uvedeno nÃ­Å¾e je uvedeno v naÅ¡Ã­ databÃ¡zi bankovnÃ­ho systÃ©mu, aby vÃ¡m ukÃ¡Å¾Ã­ jako oprÃ¡vnÄ›nÃ½ pÅ™Ã­jemce by mÄ›la bÃ½t v pÅ™Ã­padÄ› bankovnÃ­ch Å¡ekÅ¯. K dispozici bude prÃ¡vnÃ­ dokumentace, kterÃ¡ musÃ­ bÃ½t dosaÅ¾eno v souladu s Brity zÃ¡kony, aby se pÅ™edeÅ¡lo problÃ©mÅ¯m. VÅ¡echny Å½Ã¡dÃ¡m nynÃ­ je vaÅ¡e nejvÃ­ce upÅ™Ã­mnÃ¡ Co-operation a absolutnÃ­ dÅ¯vÄ›ra nenÃ­ pochyb o tom, aby nÃ¡m umoÅ¾nila vidÄ›t tuto transakci prostÅ™ednictvÃ­m. MoÅ¾nÃ¡, zaruÄuji vÃ¡m 100% ÃºspÄ›Å¡nost, kterÃ¡ bude legalizovÃ¡n v takovÃ© vzdÃ¡lenosti, Å¾e tato transakce bude provedena za legitimnÃ­ uspoÅ™Ã¡dÃ¡nÃ­ a pÅ¯sobnosti zÃ¡kona, kterÃ½ bude chrÃ¡nit vÃ¡s z jakÃ©hokoli poruÅ¡enÃ­ smlouvy, a to jak ve svÃ© zemi, a tady v LondÃ½nÄ›. -VaÅ¡e PÅ™Ã­mÃ¡ ÄÃ­sla mobilnÃ­ho telefonu. S proÅ¡la metodickÃ½ vyhledÃ¡vÃ¡nÃ­, rozhodl jsem se VÃ¡s kontaktovat doufat, Å¾e vÃ¡s najdou tento nÃ¡vrh zajÃ­mavÃ©. ProsÃ­m o vaÅ¡i pozornost tÃ©to zprÃ¡vy indikujÃ­cÃ­ vÃ¡Å¡ zÃ¡jem, poskytnout vÃ½Å¡e uvedenÃ© informace potÅ™ebnÃ© k tomu, aby mi nahrÃ¡t vaÅ¡e data do Royal Bank of Scotland – Anglie databÃ¡zi tak, aby odrÃ¡Å¾ely v naÅ¡Ã­ sÃ­ti systÃ©mu banky. PravdÄ›podobnÄ› bude banka bÃ½t pÅ™esvÄ›dÄeni, Å¾e jste ve vztahu k rodinÄ›, ani jmenoval nejbliÅ¾Å¡Ã­m pÅ™Ã­buznÃ½m / bude pÅ™Ã­jemcem (pozdnÃ­ pan Saba). JÃ¡ vÃ¡s bude vedenÃ­ o tom, jak otevÅ™Ã­t komunikaci s bankou a dÄ›lat nÃ¡roky na dalÅ¡Ã­ pÅ™edÃ¡vÃ¡nÃ­ fondu na vÃ¡Å¡ bankovnÃ­ ÃºÄet. VÃ¡Å¡ upÅ™Ã­mnÃ½ souhlas na tento e-mail a obchodnÃ­ nÃ¡vrh bude vysoce ocenil. Zavolej mi na obdrÅ¾enÃ­ tohoto e-mailu pro vÃ­ce diskusÃ­. PodÄ›koval vÃ¡m v oÄekÃ¡vÃ¡nÃ­ pro vaÅ¡i rychlou odpovÄ›Ä. The ‘sting’ is in the software – it’s useless junk, and even if it isn’t, there’s no “work”. The whole scam is to get you to part with your cash. There is no “work”, or if there is it’ll probably involve you receiving fake checks and sending on the ‘remainder’. I went to the website CEZASOFT.COM and they don’t accept credit cards [RED FLAG] and you have to contact them to buy the software, and they’ll send you back a Software Order Form which asks you to use a dubious payment provider called CashU.com, which is basically an untraceable digital conversion of your cash into easily stolen/transferred cash. I’ve warned about this scam before and the names keep changing so it obviously works. Today it is ‘BYRAM and CEZASOFT’, tomorrow it may change when too many sites such as this report on it. 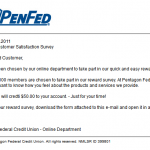 We received an email today with the promise of a $50 credit to my Pentagon Federal Credit Union (PenFed) account if I completed a customer service survey. 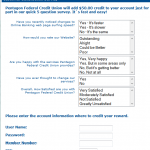 The “survey” was sent as an attached HTML (web page) file, which, when completed went to the homepage of PenFed. Apart from the simple questions, the final part of the form asked for the online account usrname and password and also the PIN number for the bank. If anyone did fill in this form, they will have handed over the keys to their bank account and should expect it to empty pretty quickly. This is a common enough scam, but stands out for the clever use of bait ($50) and the simple but plausible task required to receive the bait. Enough to blind the recipient to the dangers. A man in Caledonia, Wisconsin thought he was buying a car from a reputable website (autotrader.com) and paying for it using a reputable financial site (amazonpayments.com). Turned out that both sites were so-called ‘spoof sites’ – Identical copies of valid website, used to capture personal information such as credit card numbers/passwords or, as in this case, to make it appear that a bona-fide tramsaction was taking place. The Porche Cayman he paid $30,000 for did not show up and by the time he realised, the cash had flown to Romania. Never trust a link supplied to you from email or a website, especially if it is a financial transaction. Always go independantly to websites using your own bookmarks or typing the url in. it’s insanely easy to show the ‘correct’ link but to go to a different one when it is clicked. Financial Sites Always use ‘https’ instead of ‘httpd’. No Exceptions. Look at your online bank url when you are logged in some time. Check the address bar of your browser. It’s trying to keep you safe. Online Trading – A Warning! Online trading can be an easy, cost-effective way to manage investments. However, online investors are often targets of scams, so take precautions to ensure that you do not become a victim. profit. Also, because money is regularly transferred through these accounts, malicious activity may not be noticed immediately. To gain access to these databases, attackers may use Trojan horses or other types of malicious code. Attackers may also attempt to collect financial information by targeting the current or potential investors directly. These attempts may take the form of social engineering or phishing attacks (see Avoiding Social Engineering and Phishing Attacks for more information). With methods that include setting up fraudulent investment opportunities or redirecting users to malicious sites that appear to be legitimate, attackers try to convince you to provide them with financial information that they can then use or sell. If you have been victimized, both your money and your identity may be at risk. It’s just the usual ‘transaction processing’ scam – you get counterfeit checks, they get your hard-earned cash. DO NOT GET INVOLVED. Thank you for your reply and interest in a part-time position with TweekServ Inc. The main strategic aim of our company is to provide quick, easy, efficient and secure ways for businesses to outsource services locally, nationally and globally, to maximize their competitive advantage and cost effectiveness. The goal of our company is to ensure both, the most reliable security level and simplicity of use and availability. We are happy to offer you the Payment Processing Agent position. We welcome competent and reliable approach to work, responsibility and initiative in search of the most efficient ways of job implementation. Each Payment Processing Agent is provided with employment benefits after successful completion of probationary period (30 days). 3. Each remittance will be accompanied by an invoice ensuring legality of transaction. We appreciate your time and sincerely hope to see you in TweekServ Inc team! *Please note that some e-mails may enter your SPAM folder and may delay our process of communication. Please add our e-mail address to your filter/safe list to ensure that you receive our e-mails without any delay. If for some reason you do not hear from us within 24 hours with further information, please give us a call at 1-347-860-9971 and we will provide you with the necessary information. Hippy-eye-ay – WTF is a HYIP? A high-yield investment program (HYIP) is a type of Ponzi scheme, which is an investment scam that promises an unsustainably high return on investment by paying previous investors with the money invested by newcomers. Ok, yet another scam – so what? Well, there’s a few spam emails going about currently that sounds like a big one. People will get hurt so it’s my duty to warn you all! I would like to introduce the Investment Committee. 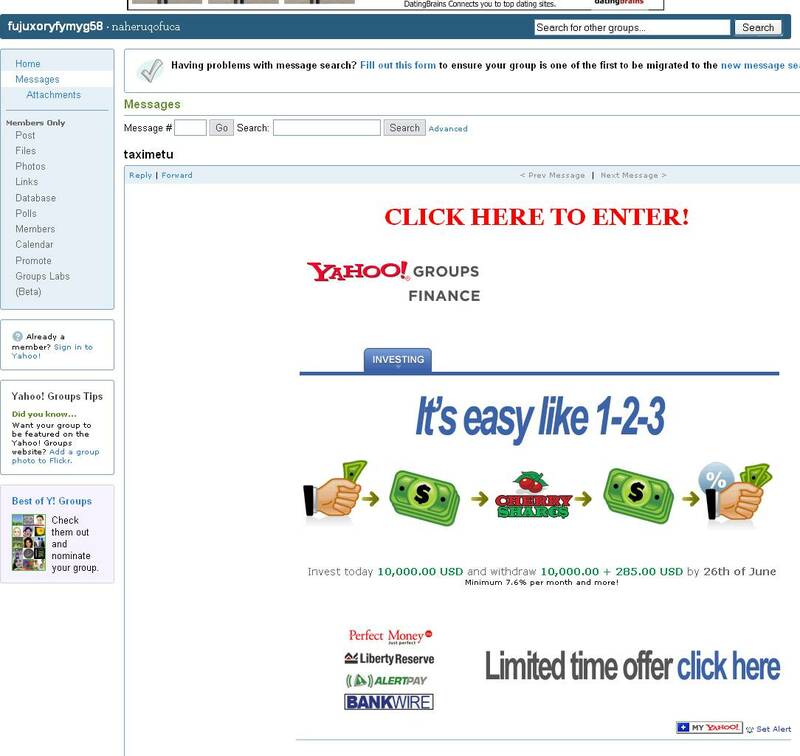 One thing they all have in common is a Yahoo Groups Page as a jump point to the real scammer’s page http://sdhfiweof.com/. ESPECIALLY if the website offers an ‘Affiliate Program’ (ie, they let you do the spamming for them!). 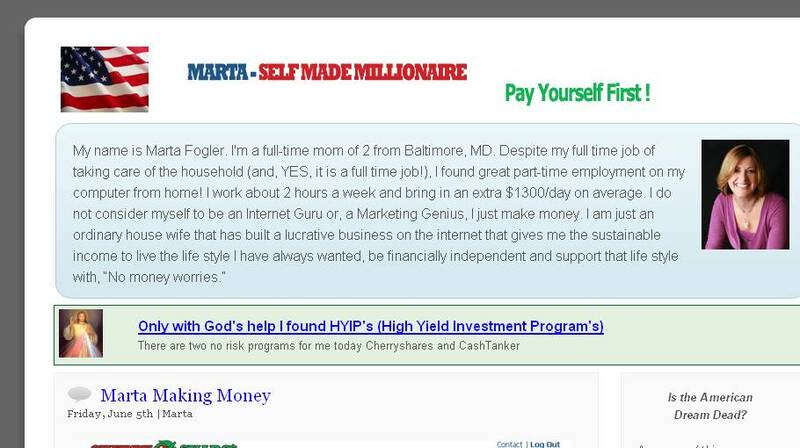 Now, I’m sure that there is a God-fearing lady called Marta, and there may even be one in Baltimore with two kids, but I’m absolutely certain that this isn’t her. It’s much more likely to beÂ Fred Milto (FredMilto@gmail.com), a "Private Person" in New York, 10017 - at least that's who the domain name is registered to. Anyway, I don’t have the time or the resources to investigate this one further, but if anyone knows more or has tried this particular scam, let me know. Below are warning signs of prime bank or other fraudulent bank-related investment schemes. These fraudulent investment pitches typically offer or guarantee spectacular returns of 20 to 200 percent monthly, absolutely risk free. Promises of unrealistic returns at no risk are hallmarks of prime bank fraud. I was alerted to a website called HYIPExplorer (http://www.hyipexplorer.com), who acknowledge that HYIPs are high risk investments but with high potential returns. They know there are a lot of scammers out there and provide a forum for people to rate and investigate these notoriously mercurial entities. If you are ever convinced to try HYIPs, please visit them and do A LOT OF RESEARCH BEFORE SENDING ANYONE ANY MONEY!!! Social engineering is an approach used to gain unauthorized access to or acquisition of information assets. This approach relies on misrepresentation and the trusting nature of individuals, and is often carried out through the use of phishing telephone calls or email. A phishing telephone call or phishing email may sound or look as though it comes from an organization you do business with, such as a bank or government entity, but they are generally from a scammer trying to obtain your personal information under false pretenses. An individual leaves a message on an employeeâ€™s work phone number, stating they are with the Golden 1 Credit Union. In this scam, the message states that the targeted personâ€™s credit and/or debit card has been temporarily suspended and instructs them to push â€œ1â€ to reach security. Do not push â€œ1â€. If you push â€œ1â€, a second recording will ask you put your card number. DO NOT PUT IN YOUR CARD NUMBER!!!! â€¢ Do not respond to unsolicited (spam) e-mail. Simply delete it. â€¢ Be skeptical of individuals representing themselves as officials soliciting personal information via e-mail, telephone or other means. â€¢ Do not click on links contained within an unsolicited e-mail. â€¢ Be cautious of e-mail claiming to contain pictures in attached files, as the files may contain viruses. Only open attachments from known senders. â€¢ Validate the legitimacy of the organization by directly accessing the organization’s website rather than following an alleged link to the site. â€¢ Do not provide personal or financial information to anyone who solicits information. More Spam than Scam, but still…. Scamdex Data used in Research – if only they’d asked! Fayetteville Boys And Girls Club Warning Residents About Scam ... Boys and Girls Club is warning residents about a possible scam in the area. The owner of a Swedish company behind a popular remote administration tool (RAT) implicated in thousands of malware attacks shares the same name as a Swedish man who pleaded guilty in 2015 to co-creating the Blackshades RAT, a similar product that was used to infect more than half a million computers with malware, KrebsOnSecurity has learned.